It's finally recipe time again! 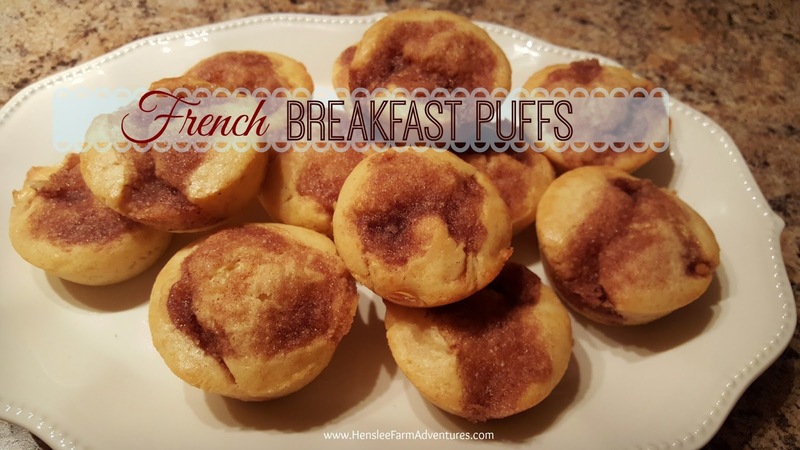 I wanted to share with you a quick and easy breakfast recipe for two reasons. The first is that I love muffins or in this case puffs for breakfast. They are easy to make and they taste so good. It is a quick breakfast that you can eat on the go, which is usually what I have to do. 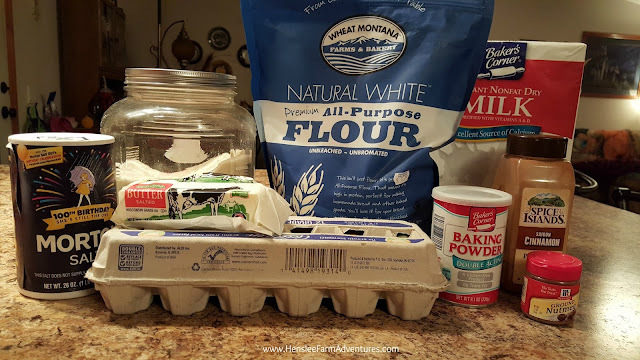 The second reason is because we are in the middle of a no buying grocery month (read about my November Food challenge), and I am in need of something for breakfast. Lunch is usually left-overs from the night before, and supper is planned and taken care of, but breakfast is another story! I remembered that my mom used to make these muffins that were spicy. Not spicy in the sense that they were hot, but spicy in the sense that they were very flavorful with cinnamon and nutmeg. And during fall, these are two of my favorite flavors. I found her recipe and whipped up a batch so that finally, I will have something besides toast for breakfast! Here is the super easy recipe. You can see the ingredients above. They are your basic staples. I thought about throwing in a banana, but I was just too tired to start experimenting. So maybe next time I'll mix things up a little. Notice that also I am using powdered milk instead of regular milk. This again goes back to the no buying groceries this month and we are out of milk. First mix together 1/3 cup melted butter, 1/2 cup sugar, and 1 large egg until well blended. 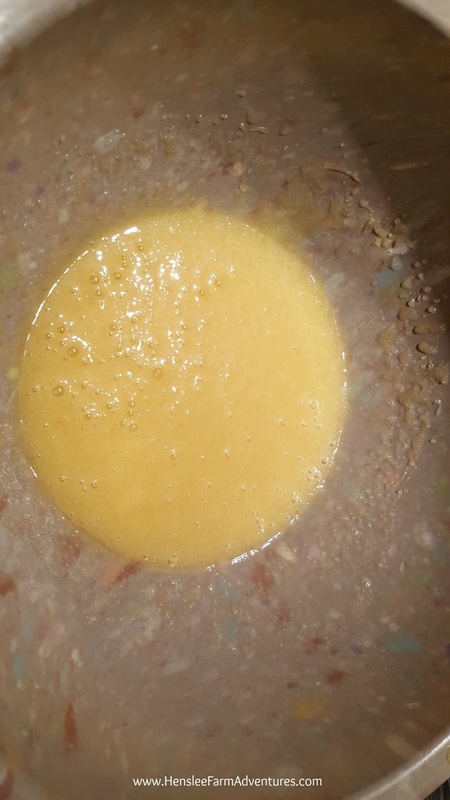 My butter, sugar, and egg mixture, all mixed up! 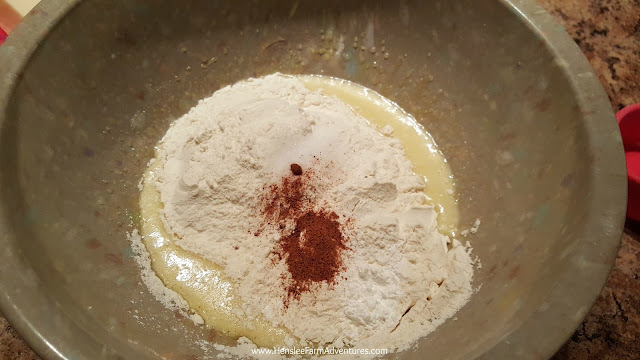 Next, in a separate bowl, mix together 1 1/2 cups all purpose flour, 1 1/2 teaspoons baking powder, 1/2 teaspoon of salt, and 1/4 teaspoon of ground nutmeg. Alternately add the flour mixture and the milk into the butter mixture, starting and ending with the flour mixture. This is where I goofed. I didn't read far enough down on my mom's recipe and just dumped the whole flour ensemble into the butter mixture. There was nothing I could do, but just pour in the milk and mix it all together. Don't do what I did, because as you can see in my finished muffins, they didn't have a nice rise to them. They tasted great, but they weren't as pretty. My goof, don't just throw the flour mixture in there. I meant to put it in a separate bowl. Then beat at low speed until blended after each of the flour/milk additions. 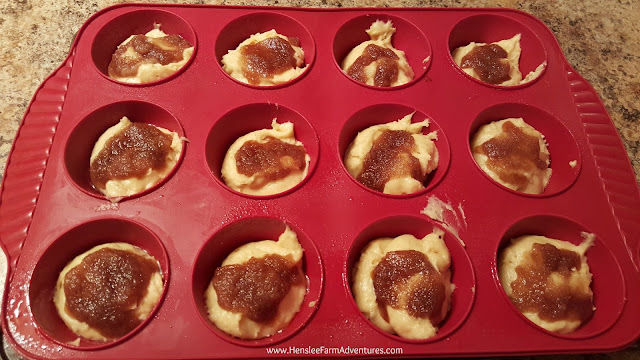 Spoon batter into greased muffin pan filling 2/3 full. I filled a large muffin pan a little less than this so I could stretch the batter and get 12 muffins out of it. You can also make mini muffins as well. Before you put these little gems in the oven to bake, don't forget the topping. Mix together, 2 tablespoons of melted butter, 1/4 cup of sugar, and 1/2 teaspoon of sugar. After putting the batter into the muffin pan, spoon the topping on top. Bake in a 350°F preheated oven for 20-25 minutes for large muffins or 14-16 minutes for mini muffins. These are so good. If you like nutmeg, you will love these! They especially go well with a cup of coffee or hot breakfast tea. They actually remind me of a coffee cake, a nice moist cake-like consistency, with a sweet crunchy top, which I love! These were so good for breakfast, with my coffee. If you want a printable version of the recipe, you can get it HERE. I hope you try these! Please let me know in the comments what you think about this recipe!